Furthermore, there are a lot of logical contradictions when you posit an all-knowing God along with an intrusive God who is constantly tinkering in our world. 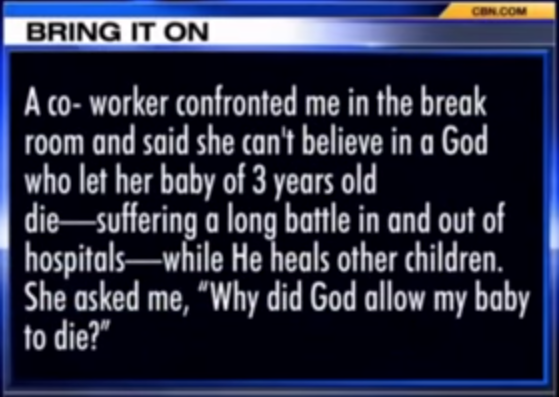 Case in point, Pat Robertson positing the reason that God took a 3 year old child away from his grief stricken mother. For those of you who don’t know, Pat Robertson is one of the most famous and popular televangelists out there. He’s been around for a looong time. And he’s a constant source of entertainment for non-believers because of the seemingly crazy things he says. But in this case, Pat is probably parroting the thinking of many theists and that is that God is a puppet-master who is in control of everything. Human beings have responsibilities and sometimes people die in hospitals for malpractice. Or nurses. Don’t blame God for people’s mistakes. God knows the end from the beginning and he knows that baby could grow up to be Adolph Hitler, or Joseph Stalin, or some serial killer (maybe like God himself — sorry, low blow), or he could grow up to die of a hideous disease. God sees all that. For that life to be terminated while he’s a baby means he’s going to be with God forever in Heaven so that isn’t a bad thing. So how could a good God do that? The good God is going to take that baby to Heaven right now and that isn’t a bad thing. So what was God doing with those babies? Pat is telling this poor woman that her 3 year old was destined for mass-murder or a hideous disease. So he pre-empted it with a hideous disease for the first 3 years? Not to mention the parents’ misery for their remaining days on earth. And another rub, these attributes granted to God make perfect sense to believers like Pat Robertson but make no sense to the parents of this 3 year old (or anyone with any sense). So even if Pat is right in his theology and that baby goes to Heaven, the parents are destined for Hell when they stop believing that Pat’s God is good. Yes, God works in mysterious ways. No doubt about it. All the answers will be revealed when we get to Heaven. Or maybe the answers are lying right in front of us now, if we just pay attention and use logic to decipher the answers. ← Did the Devil create earthquakes?